The major news today is of Mars Inc buying Wrigley’s for $23 billion. A 28% premium over Friday’s close. Wrigley’s basically owns the chewing gum market with 50% market share in the US as well as a strong presence internationally. Because of its gigantic moat and simple to understand business, it has been one of Buffett’s often used examples in speeches. No wonder he doesn’t mind putting up $6.3 billion in cash to help finance the deal for a minor stake in the company. In a phone call with CNBC, Buffett explains his reason for helping finance the deal in current volatile times. What do I like about this answer? It’s just a simple, straight forward, common sense answer. He doesn’t quote the high or low price, the PE or anything regarding valuation. Watch the Wall Street analysts talk about the deal and they will start getting into arguments with one another over why the price is as it is, what’s going to happen to the other companies, who is going to get what etc etc. They start introducing so much noise into the conversation that the whole essence of “paying a fair price for a great company” is gone. For the past 10 years, Wrigley’s FCF has grown at a rate of 14.4%. Like all companies, we’ll have to make assumptions of the future. 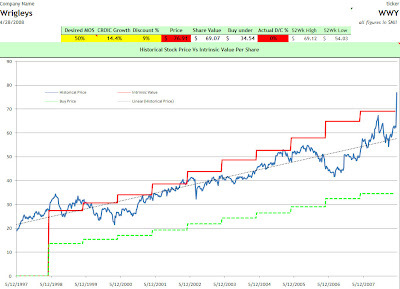 With a sensible discount rate of 9% and keeping the growth rate as 14.4% slowed down to 5% after 10 years, the intrinsic value of Wrigley’s comes out to $69.07. Graham tells me he also agrees with an intrinsic value of $69.85. Friday’s closing price was around $62. That’s an error margin of approx 12%. As you can see, Wrigley’s has traded at a fair price compared to its intrinsic value. Perhaps the only real opportunity would have been to buy in mid 2006, but even then, it was never a deep discount. However, this is a prime example of a Buffett type investment. A business that is simple to understand with a huge moat that he could hold onto forever without worrying about day to day operations. Post featured on 87th Festival of stocks at Finance Viewpoint. Good analysis and I may still buy this stock for the long term.